At their National Museum of Dance wedding, Amelia and Jason take a walk in the late afternoon sunlight taking just a few moments away from their wedding reception. Natural wedding photos and more importantly natural light wedding photography are a specialty of mine as a wedding photojournalist. Many photographers who are new will call themselves natural light wedding photographers. It sounds good as a marketing line. But what it really means is that the photographer isn’t skilled at using, or knowing when to use, artificial or supplemental light at a wedding. 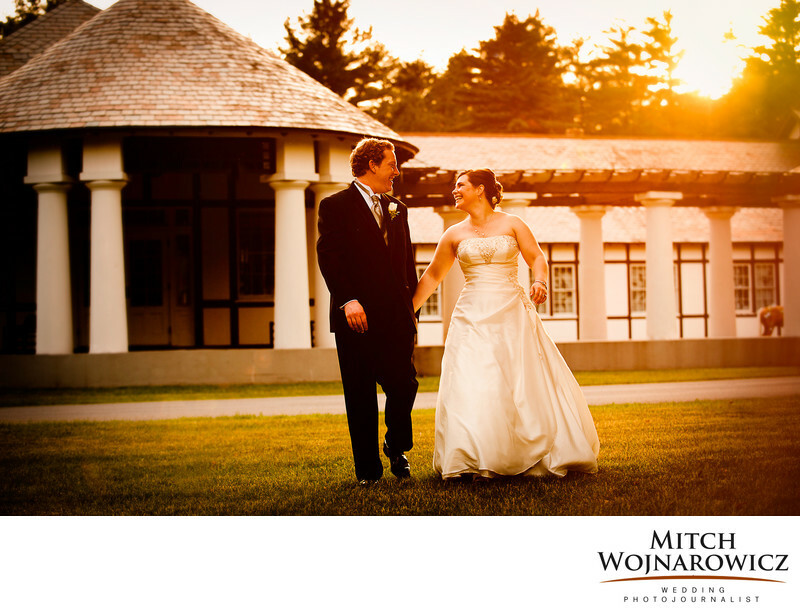 As you can see in this Saratoga wedding photo taken late in the day, I am experienced at knowing when the best time of day is for natural light wedding photos and am skilled at using the lighting we do, or don’t, have to make great wedding photos for you. It’s all about experience and knowing how to read the setting and the lighting, how to anticipate and be in the right place to take advantage of conditions which might not even be obvious. Except to someone like me who works hard on your wedding plans and is thinking ahead to what WILL happen. Not just reacting to what IS happening. Let’s talk about your Saratoga Springs wedding, wherever it is taking place. Whether you are having a big formal wedding at a venue like the Hall of Springs or a Canfield Casino wedding. Or a more casual event on the shore of Saratoga lake or the gardens of Yaddo. I’ve been to them all and can bring back great photos for you from them. And think about what sort of wedding photographer you are ultimately looking for. Is it one who stages a lot of wedding photos, using stock poses and checklists? Or do you want someone who will take care of the standard posed wedding photos in quick order, allowing much more time for spontaneous images, giving you much, much more time to actually attend your reception. It’s a rule of mine that couples who work with me, who actually get to BE at their wedding instead of spending 2 hours shooting staged portraits, are far, far happier. And happy people make the best subjects for photography. Get in touch with me today to talk about your Saratoga Springs Wedding. Keywords: national museum of dance (6), saratoga springs (66).